"The contemplation and use of hypernumber forms and properties will prove and already has proved both by self-experience and teaching to be a most efficacious and irreplaceable method of evolving into conscious access the powers and capabilities of our superconscious selves. And that way man's future lies." Now Musaios discovered that there are seven kinds of hypernumber that exist beyond the square root of minus one (also referred to as u2,) which he called u3,, u4,, u5, u6 , u7 , u8 and u9. Now these eight kinds of number actually map upon the eight powers of the outer ring of the Magic Square and thus also correspond to the seven pleromic worlds of the central Q-universe and the 7-D universe that lies beyond it (see appendix 1, Access). "For long centuries men had believed there was only one kind of number: that which distinguised sizes or magnitudes, whether of collections, lengths, or angles (orientations) as on a clock dial (or compass). Though it had been encountered in medieval India and Renaissance Europe, the square root of minus one (a hypernumber) was not realized to be a perfectly existent and useful alternative kind of number until the seventeenth and eighteenth centuries. In the nineteenth century a whole vast extension of the theory of functions or number relationships was made possible through the square root of minus one and is called the theory of functions of a complex variable. Without it electromagnetic wave theory and quantum theory could not be written." "Thus the comparatively simple expedient of one new kind of number more than doubled the entire mathematical power of all the previous centuries, and became intimately related to the new physical discoveries in electronics, atomic theory and twentieth century chemistry. It can only be imagined what the adjunction of further new kinds of number will achieve, for the kinds of num-ber comprise the core of mathematics itself, creating whole new algebras and function spaces." Thus the power of the square root of minus one as a mercurial (connecting) power is clearly revealed in that it vastly extends the kinds of relationships between numbers, and also extends the linkages between the sciences of mathematics with those of physics and chemistry. Its complementary power, the Jupiter Square Power or u6 is described by Musaios in chapter 26 as pertaining to ecology, feedback and the stability of systems, as well as the types of entropy, or energy loss, such systems experience. As the deployment of hypernumber u2 in mathematics generated powerful interdisciplinary linkages to other sciences, the impact of human knowledge on the natural world (atomic energy generation, electronics, and chemical weapons for example) greatly intensified. The application of this knowledge inevitably stirred up the workings of the opposite power, u6, in response, thus generating unprecedented feedbacks into all kinds of systems, including ecological ones and destabilizing the natural world. It is interesting to note in this context that scientific and public awareness of global climatic changes has increased tremendously since November 2002, when the hypernumber powers began to act directly upon the world through the medium of the Magic Square Cycles. The positive side of this development is, of course, that the gods are permitting the irrevocable damage to the biosphere to occur so that the evolutionary 'catapulting' of all forms of life on the planet may be more quickly brought about. 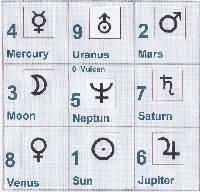 The second pair of hypernumbers corresponds to the Moon Square Power or u3 and the Saturn Square Power or u7. No description of the unique consciousness altering qualities of the hypernumber corresponding to the Moon Square Power is given under the section heading "Hypernumbers and Cosmology", although Musaios does state elsewhere in chapter 26 that u3 as well as u2 "enters into the concept of a fractional dimension, which is no more a broken dimension than a half-formed baby is a baby cut in half. The geometry of fractional dimensions involves, we also found, very fascinating wave and frequency forms, and shows that all geometries of integer dimension possess a wave-like microstructure." However, the hypernumber corresponding to the Saturn Square is described as "the actualization of the potential selfhood for evolutionary and metamorphic transformation", which leads to the deduction that the Moon Square hypernumber, as the inherent partner of the Saturn power, must represent the inherent potential of the selfhood for evolutionary and metamorphic transformation. In other words, the hypernumber of the Moon Square relates to the infinite, plastic and unformed potential within each one of us that would permit us to transform into beings of higher evolution if we steadily apply ourselves to that goal. Thus it is the task of the Saturn Square hypernumber, to solidify and make permanent the consciousness changes we are aspiring to, turning our ideals into stable and reliable self-enhancing habit-patterns. This, of course, ultimately depends upon on how dexterously or otherwise we handle our karma and circumstances. Saturn is the inexorable measurer - the one who cannot be deceived, who measures exactly the extent of the actual spiritual and internal growth that has occurred and thereby fixes the new destiny pattern in place. The third pair of hypernumbers correspond to the Venus Square Power (u4) and the Mars Square Power (u8). Musaios describes the hypernumber of the Venus Square as "able to map the nature of attention focus and intensity relevant to the nature of the selectivity, conditioning and cueing of attention, and hence to the power of suggestion, and the consequent altering of states and levels of suggestion." In other words, the Venus Square hypernumber has the ability to intensify hypnosis so that very deep levels of consciousness in the subject are affected in a benign and healing way. Its complementary power, the Mars Square, which is described as "the only hypernumber that can represent the modification of time by affecting the amount of available energy, and hence the duration needed to achieve a given outcome." This means that the hypernumber of the Mars Square generates the power to speed up events, and so change destinies or potential outcomes. We can see how these two powers are related and work together by imagining the case of a person who, under hypnosis, releases a deep fear or trauma, and is thereby enabled to react to a coming crisis in a more positive way than would otherwise have been possible. Alternatively, this person might thereby be able to release hitherto hidden talents and take up a new career that would otherwise have been beyond their reach. In either case, the whole pattern and outcome of a person's life may be changed. The final pair of hypernumbers (u5 and u9) corresponds to the Sun Square and Uranus Square Powers. Musaios describes the Sun Square hypernumber as one that "can map memory processes, including transconscious memory". It thus bestows access to areas of one's memory that one possesses, yet which one is not usually aware of in a state of ordinary consciousness. The Uranus Square hypernumber is described as "constant integration through time, which is characteristic of selfhood or individuality". 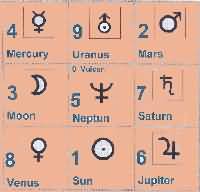 We know that the seven other powers of the outer ring of the Magic Square are integrated and unified during the Uranus Square session. They are integrated through time, which means becoming accustomed to the experience of the seven powers working together, instead of fighting against each other as they normally do. The Sun Square is the power complementary to the Uranus Square because it is the realm of the transconscious mind, containing everything we have ever learned, not only in this life, but also the skills of prior incarnations. The Sun Square power opens the way to recovering those memories and skills, but it is only during the Uranus Square power session that this knowledge is permanently activated and recovered as a part of the selfhood and identity. In ancient Greek teachings on this Magic Square, the Uranus square was called "aletheia" meaning that it countered the force of forgetfulness. "Lethe", its opposite, was the river of forgetfulness that the soul traverses after death on its entry into the bardo. We can also ask what kinds of number, if any, might be attached to the central square power of the Magic Square, which corresponds to the infinite Source of All Life that lies above and beyond any specific manifestation. There are in fact two such numbers, just as the central Square has two cosmic powers embedded within it: those of Neptune and Vulcan. As Musaios states in chapter 26, "Zero turns out to be u0 and u1 is the unit of ordinary numbers for measurement in the sensory world." Now the power of Neptune at its ultimate cosmic level, clearly corresponds to the realm of infinitesimals - or infinite potentialities, which, by the nature of the Source of All Life, are inexhaustible. But why does Vulcan, the power of magic itself, map onto the power of apparently ordinary number? It is because the number system has the quality more than anything else in the manifest world of "distinguishability" as Musaios expresses it. And Vulcan is the cosmic power of distinguishability par excellence, for it can detect and take account of even the slightest distinctions and differences between things, whereas Neptune fuses everything into ultimate oneness or unity - in that all manifest things originate from the Source of Life and draw their life-force or sustenance from it. "We are thus assured of two things: the impossibility of communicating all that reality contains at any moment, but the possibility of communicating this at some future moment, by which time reality would again have outstripped ability to communicate. Thus the goal of a completely explicit science is fatuous because it simply misses the point of the cosmos. The goal of science should be to understand the basic principles of how our presently perceived cosmos came into being, how it is maintained, how it may be transformed, and how we may transform ourselves out of it - and what the world would then be like. There is no absolute ineffability, and there is likewise no absolute communicability at any given moment." "Number refers to distinguishability; and its operations to the interaction properties of distinguishable things. Hence number can code mind and sensorily observed nature at the same time." "Further, things not yet speakable of in and of themselves may still be coded and the code discovered, used and discussed by those not yet aware of its experiential reference and meaning. Number can code all reality, whether experienced or not, in such nonarbitrary fashion as to reveal objective insights into the nature of that reality even before direct conscious experience with it. Thus things we do not and even cannot yet know may still be coded by number. Knowing this, however, enables us to see the properties of number more consciously as a code of reality, and arrive at an experience of it much more quickly than without the aid of that unique code� knowing that we have the code of something not yet known puts the unknown that much more within our grasp. Number is thus the most powerful antidote to ineffability that man can use." But there is still more to be gleaned from an understanding of the deepest nature of number. For the phenomenon of number itself emanates from a source of cosmic intelligence far more exalted and benign than anything as yet attained by humankind. "Nothing encodes itself. Only intelligence encodes or decodes. Hence some intelligence has arranged the predictive agreement (between reality and the number code) we call science. The coding of as yet unexperienced reality in terms of experienced forms, of which numbers are the most refined, is never absent in reality. (If it were, the unity would be broken, the code would not apply, experience would become arbitrarily inconsistent and reality would self-destruct.)" It is awe inspiring to realize that the beings at the source of cosmic intelligence, what we call the gods who govern the Lion Path, have now released upon our planet the immense noetic powers of the hypernumbers that lay hidden within the Magic Square. Consequently, Musaios' words from the 1970s, that The contemplation and use of hypernumber forms and properties will prove to be a most efficacious and irreplaceable method of evolving into conscious access the powers and capabilities of our superconscious selves were deeply prophetic. We are now experiencing, in the two Magic Square Cycles of the Lion Path, the action of hypernumber powers on a hitherto unprecedented scale, activating the entire realm of our biosphere and profoundly altering the destinies of all living beings upon earth.